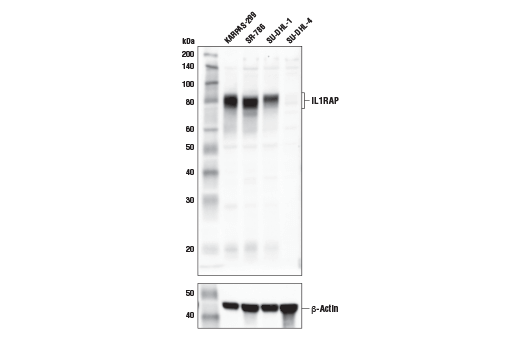 Western blot analysis of extracts from various cell lines using IL1RAP (E2G6A) Rabbit mAb (upper) and β-Actin (D6A8) Rabbit mAb #8457 (lower). As expected, IL1RAP protein expression is not detected in SU-DHL-4 cells. KARPAS-299 cell line source: Dr. Abraham Karpas at the University of Cambridge. 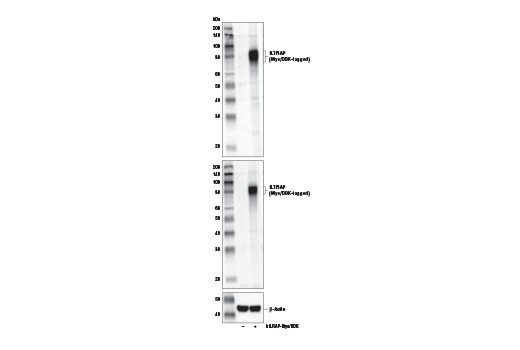 Western blot analysis of extracts from 293T cells, mock transfected (-) or transfected with a construct expressing full-length Myc/DDK-tagged human IL1RAP protein (hIL1RAP-Myc/DDK; +), using IL1RAP (E2G6A) Rabbit mAb (upper), DYKDDDDK Tag Antibody #2368 (middle), and β-Actin (D6A8) Rabbit mAb #8457 (lower). Immunoprecipitation of IL1RAP from KARPAS-299 cell extracts. Lane 1 is 10% input, lane 2 is Rabbit (DA1E) mAb IgG XP® Isotype Control #3900, and lane 3 is IL1RAP (E2G6A) Rabbit mAb. 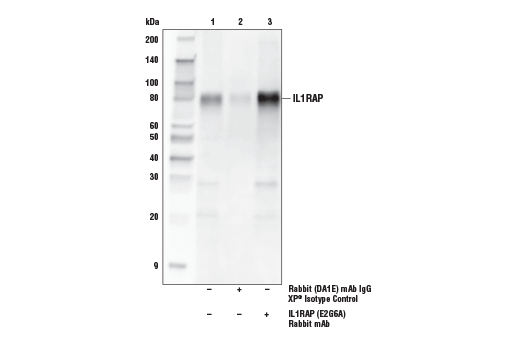 Western blot analysis was performed using IL1RAP (E2G6A) Rabbit mAb. Mouse Anti-Rabbit IgG (Conformation Specific) (L27A9) mAb (HRP Conjugate) #5127 was used for detection to avoid cross-reactivity with IgG. IL1RAP (E2G6A) Rabbit mAb recognizes endogenous levels of total IL1RAP protein. Monoclonal antibody is produced by immunizing animals with a synthetic peptide corresponding to residues near the carboxy terminus of human IL1RAP protein. Interleukin-1 receptor accessory protein (IL1RAP/IL1R3) is a type-I transmembrane glycoprotein and component of the IL-1 and IL-33 receptor signaling complexes (1,2). Research studies have demonstrated that IL1RAP expression is required for IL-1-mediated signaling through its ability to recruit IRAK to the IL-1R complex (3-7). In the context of human disease, research studies have shown that IL1RAP is overexpressed on the surface of AML stem cells and associates with c-KIT and FLT3 to mediate pro-proliferative and pro-survival signaling events downstream of these oncogenic receptor tyrosine kinases (8,9). As such, IL1RAP has emerged as a novel immuno-therapeutic target for AML and other malignancies of the myeloid compartment (10,11). Greenfeder, S.A. et al. (1995) J Biol Chem 270, 13757-65. Chackerian, A.A. et al. (2007) J Immunol 179, 2551-5. Radons, J. et al. (2002) J Biol Chem 277, 16456-63. Huang, J. et al. (1997) Proc Natl Acad Sci U S A 94, 12829-32. Wesche, H. et al. (1997) J Biol Chem 272, 7727-31. Gould, L. et al. (1979) J Clin Pharmacol 19, 46-55. Volpe, F. et al. (1997) FEBS Lett 419, 41-4. Mitchell, K. et al. (2018) J Exp Med 215, 1709-27. Barreyro, L. et al. (2012) Blood 120, 1290-8. Askmyr, M. et al. (2013) Blood 121, 3709-13. Ågerstam, H. et al. (2015) Proc Natl Acad Sci U S A 112, 10786-91.